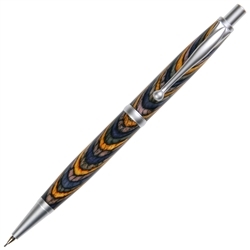 Use Cross Style Comfort Pencils from Lanier Handcrafted Pens for Ultimate Writing Comfort! If you use your mechanical pencil a lot for writing, drawing or drafting, then you need one of Lanier’s Comfort Pencils. You can make the pencil your own by selecting the exotic wood and plating, but most importantly you can add a black rubber ‘comfort grip’ to turn these beautiful pencils into comfortable writing instruments. Each mechanical pencil is light weight, perfectly balanced and designed to facilitate ease of use no matter what you use it for. It’s by far the most comfortable—and beautiful—pencil you can own. Perfectly balanced, you can customize your Comfort Pencil by selecting the wood you want to use for your pencil. If you’ve ever desired a “piece of the Orient”, you can select one of the beautiful hardwoods from Asia’s jungles. You can even select one of the exotic woods from the Australian outback, or from the high plains of Africa. Another option is to choose one of the longstanding hardwoods from the frontier forests of the United States or other locations from around the world. Then select the plating option – like 24kt Gold or Rhodium – for your trim on the cap, clip and tip that will enhance the beauty of the wood you select, and make your pencil more durable. Your Comfort pencil is bound to last for generations and with the rubber grip feature your writing hand will never tire! Our Comfort Pencil uses .7mm pencil lead, and features a smooth, trouble-free precision click lead dispenser mechanism. It also features a concealed eraser under the cap when you need to clean up a mistake. If you’re looking for a promotional pencil, the Comfort Pencil is great for executive gifts, corporate awards, prizes and even gifts for that special person and occasion. You can personalize your mechanical pencil for yourself or as a gift, by having your pencil engraved, in addition to a Rosewood or Maple gift box. You can also order a matching Cross Style Comfort Pen to make your gift or collectible even more special.